BRANDON, MB – This past Friday, Dr. Deborah Poff, Brandon University’s President and Vice-Chancellor, was joined by Jamie Honda McNeil, Enbridge’s Manager of Aboriginal Affairs, at a celebration for the two student recipients of the newly-established Enbridge Dakota Language Scholarship. 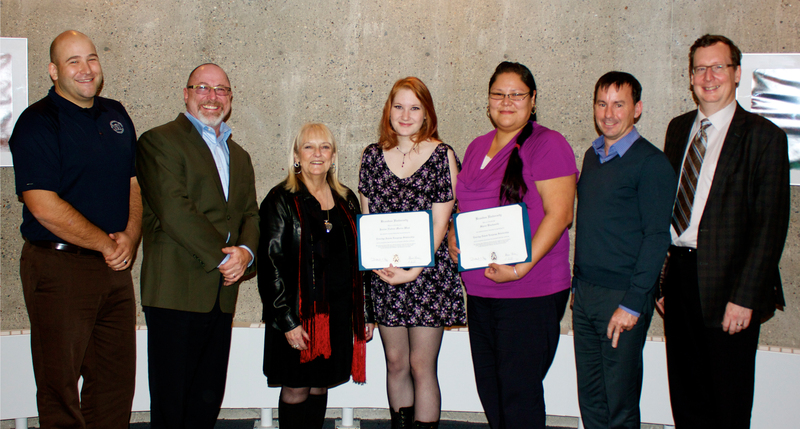 Recipients Sheree Blacksmith, currently in her first year of study in the Indigenous Health and Human Services program, and third-year Native Studies and Languages student, Janine Morin-West, were accompanied by their family members and senior administration from Brandon University to honour their achievement in receiving this award. The event marks the beginning of a three-year partnership with Enbridge in support of the Dakota language. Committing a total of $60,000 to Brandon University, Enbridge is the direct funder of the Dakota Language Program in the Native Studies Department, and supports two annual student scholarships valued at $2,500 each. Dr. Bruce Strang, Dean of Arts at Brandon University, was pleased to join the group and celebrate Brandon University’s new Dakota Language Program, as well as the two students’ achievement.